Blair began his legal career as a federal law clerk to U.S. District Judge Sharon Lovelace Blackburn (Northern District of Alabama). His work for Judge Blackburn encompassed all types of federal cases, with a particular emphasis on employment matters. Following his clerkship, Blair worked in the New York office of international firm Skadden Arps, where he focused on white collar litigation and investigations. At Skadden Arps, Blair worked on civil and criminal white collar cases, as well as investigations of alleged fraud, embezzlement, antitrust violations, economic and trade sanctions violations, and violations of the Foreign Corrupt Practices Act. As a member of McDowell Knight, Blair primarily handles business litigation cases in the areas of breach of contract, insurance coverage and bad faith, indemnity, landlord/tenant, shareholder/partner disputes, employment, banking, real estate, construction, defamation, fiduciary duty and professional malpractice, and collection. 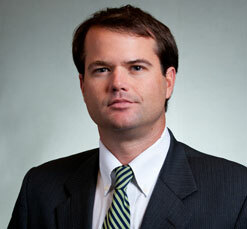 Blair is also experienced in defending personal injury and wrongful death cases. Blair has tried cases in state court and federal court, to judges and juries, and has obtained favorable verdicts and pretrial results. He has appeared in state court proceedings in circuit, district, and probate court, federal district court proceedings, bankruptcy court proceedings, arbitrations, and appeals. Blair is a Mobile native and lives in Mobile with his wife Diana and their two children. Obtained summary judgment on behalf of lender on claims of fraudulent transfer. Obtained favorable results in corporate shareholder dispute and defended results on appeal. Obtained summary judgment for practice group in employment arbitration. Obtained jury verdict for landowner in premises liability case in state court. Obtained verdict for lender in bench trial in federal court. Successfully represented landlords in nonpayment and other disputes with tenants. Advised and successfully represented insurance companies and insured businesses in coverage disputes. Obtained summary judgment for supplier against surety. Obtained dismissal of patent infringement case. Successfully represented lender in protracted and complex collection case. Successfully handled breach of contract cases for contractors. Obtained summary judgment for stevedoring company in wrongful death case.